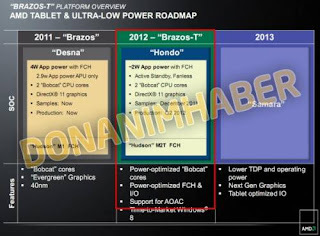 AMD has just introduced a new chip named Desna for tablets last month, but the site DonanimHaber from Turkey has gained a slide that contains the information leaked details about the low-power chips from AMD's latest tablet that will come out in 2012. The new chip has a code-named Hondo, and AMD plans to launch simultaneously with the time Microsoft launched its Windows operating system 8. Hondo chipset will feature dual-core processors with 4.5TDP respectively. But the slide show to use your chip "power" is lower about 2 watts. 40nm processors will include the Radeon HD 6250 graphics chip and will be able to handle 720p HD video playback and DirectX 11 graphics. Besides low-power chips / energy saving is designed for use on computers without a fan meaning it will not generate much heat. According to the leaked slides, AMD will send you a sample chip for hardware partners Hondo in December 2011 with a processor is expected to go into production in the second quarter of 2012.